The title is ugly, but the statistics don't lie. Only 1% of people that attempt to make worthwhile money from affiliate programs actually succeed. Let's examine some of the big reasons why. First, let's take a step back for a second and look at the theme and/or concept of your website. Are you really knowledgeable about the topic you've chosen? Are you extremely passionate about it? Perhaps there are thousands of web sites out there similar to yours and you thought that your site would be THE ONE to stand above the rest. Did you just choose the topic because you saw others doing it and it just seemed easy? Did you join one of those affiliate/money-making programs where you're given a replicated website? And..the company tells you to announce it to everyone and you get paid when your friends join under you or make some kind of purchase? You assumed you could just submit this site to Google and advertise it in the online free classifieds and VOILA...you'd be rich! These are common mental blunders that affiliates have made since the inception of the affiliate program, and unfortunately they continue to do it over and over again. There are so many sites out here like that people figure they can just mimic the ideas and concept of an existing website and become just as successful. Let me explain. There's absolutely nothing wrong with taking someone else's concept and trying to improve upon it in an attempt to achieve even greater success. Just make sure you use your own content and do not violate any copyright laws. You don't have to rumble with the big dogs to make the big dollars. The "big dogs" are people that have been in the industry for years, love what they do, and have already made tons of money doing it. There's no point in trying to beat them at their own game...especially when you haven't even learned the rules yourself. The real secret to his success is not about it being easy or difficult. It's the fact that Allan loves what he does and he does it better than anyone in his own niche. Another reason why so many affiliates fail in work-from-home businesses is their failure to advertise properly. You must have a product, service or information of value, a message to market and/or sell your offering and advertising venues or outlets to get your message to the people that need to hear it, see it and/or read it. Advertisement should be consistent and not sporadic for maximum exposure. Good advertising will help your business venture up the ladder to success and it is the most important activity you can do to grow your business rapidly. The following reasons are why you need to advertise and why it is necessary and important for your business success. 1. Millions of people don't know you. 2. The people that do know you, may not know what you are doing. 3. Advertising introduces you and your product/service to the public. 4. Advertising helps people find solutions to their problems, needs, desires or wants. 5. When done properly, advertising connects with people, intellectually and emotionally. 6. Without advertising, your business is "Dead on Arrival". 7. Rapid growth and advertising are opposite sides of the same coin. Advertising can take many forms, from word-of-mouth to sky writing. The goal of advertising is always the same. Make people aware of your product, service, or offering. Without this awareness, no one will know that you can help them. And... You can help people improve their standard of living or financial security by increasing their income or exposing them to beneficial products, services and/or information. Internet Based Business Group: If you have an Internet Based Business or Business Group, you will need to advertise online and off. Online advertising is not as involved as offline advertising and you don't have as many sources. Your objective is to take advantage of as many advertising sources and formats as you can afford. It is also no secret. There are always exceptions, but as a general rule, the individuals that make the most money online do the most advertising and the most creative advertising. Your site will evolve into something greater than you may have ever imagined. Instead of being a copy-cat, become a copyright. Discover your passion, develop a web site about it, and join affiliate programs that compliment your passion. 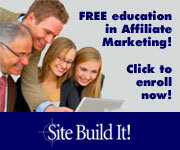 Your site does not have to fall into the business/MLM or marketing categories to earn revenue. Visit http://passion.sitesell.com to learn how to profit from a topic you enjoy and Self Promotion to learn how to make your website more accessible to search engines. Before leaving, please continue to our "Helpful Business & Information Links" page for insights that will inform, educate or enrich you financially. Use the link in this paragraph or click the button below. Thank You!